What's the secret to getting results? Amazingly it's not some online marketing trick or strategy. It's just plain old follow up. But how do you follow up? And how can you have a marketing strategy—especially for your small business? 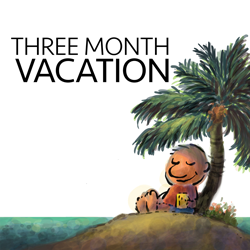 In this episode of the Three Month Vacation from Psychotactics, you learn exactly how to follow up to get results. I've not always lived in New Zealand. I lived in Mumbai, India for a long time and back then, I used to be a cartoonist. I wasn't so much into marketing or not into marketing at all. Even as I say that, somehow it seems odd and the reason for that is because even without realizing it, I was using the concepts of marketing, so let me tell you this story. Even though I grew up in Mumbai, I mostly drew for newspapers and magazines and places like that. The pay is terrible there because all of the syndicates like Universal feature syndicate and all these syndicates that send out cartoons, they just mass dump the cartoons into other countries, including India. It's so cheap that a newspaper or a magazine can just bring dozens of them. If you look at the cartoon pages, they are there every single day, a whole page of cartoons. There I was competing against this absolutely dirt cheap, probably 20 cents a cartoon scenario and of course I couldn't make a living doing that, so I started looking out for companies because companies do presentations and within presentations, you can use cartoons. At one point I picked on this computer company called Compaq. Yes, it was a lesson for me in sales and marketing too because when you're a small business especially, you don't know whether you should follow up. If you're a big business, you can just buy ads and flood them in the marketplace and repeat them ten thousand times and maybe they'll do the job and maybe they won't, but you have those deep pockets, but if you're a small business, what do you do? You follow up, but how do you follow up without becoming a pest? The first thing we're going to cover today is how do you follow up without becoming a pest. The second thing is how often do you follow up and then we'll look at some real life situations from Amazon and also from our site at Psychotactics and how it has made a difference to our business. When I say a difference, this has been the difference between a client buying nothing and ending up buying twenty or twenty-five thousand dollars worth of product and services over time. Let's start with the first topic which is what are the tools that you use to follow up? What are the systems that you're going to use to follow up? There are actually two tools that probably encompass everything that you need to do with follow up and that is to educate and the second one is to sell. Now both of them are incredibly important. You might think that the education is more important than the sales, but it's not. Both of them are very, very important, so when I first started out as a cartoonist and I just moved to New Zealand, I was not only a small business, but a small business with no clients and with no understanding of what people in New Zealand were buying and where to go. In short, it was like just being born in a business. It was brand new. Of course, you do what most businesses do. You get in touch with clients and this is a consulting business, a business that's not online. You get in touch with them, you go to some meetings and then you get a name of someone and that's what I did. I got some names of some art directors and I started sending them a calendar. Not just a calendar once a year, but a calendar every month. Now it would have been cheaper to send it once a year, but they got a reminder from me every single month and it was a useful calendar. It had space to write down things and yes, it was just photocopied on color paper and it did the job. That is a kind of educational followup. If you're online, your followup tends to be with articles, with PDFs, with reports, with some sort of giveaway and as we know, this is increasingly getting harder every minute because of the fragmentation of media. It used to be easy before or easier, but it's getting much harder, so you've got to consider that you are going to follow up both offline and online and we do this ourselves. We get clients and then we send them a bar of chocolate. We send them postcards. Now consider that our business has been online since 2002, so we've got a reputation. We've got clients that love our work and yet, we're still using that age-old system of offline marketing. We're still following up bit by bit. We still keep in touch with clients through email, just sending them a note saying how are you doing, what's happening and yes, it's all taking time. We're all super busy, but the point is that once you have a client, once you have a contact, your job is to keep following up. Now you can follow up with educational material like articles or reports or podcasts or webinars or anything, but as long as they are on a regular basis. Now what you might not realize is that following up and selling your product is just as important. Notice what you do when you buy a book. Say you buy a book by an author. Say it's James Patterson. What happens next? You want to buy another book by the same author and then a third book by the same author, so in effect, when you don't have a product and you don't follow up with selling a product, you are preventing the client from coming back. At least a fifth or a fourth of your communication with clients needs to be one of sales. There's education or there's entertainment or whatever you're sending out for the three-fourth, but one-fourth needs to be some kind of offer, some kind of sales, some kind of incentive so that they can then decide I want to buy this product or service. This might not seem very intuitive at the start, but it's what holds the business together. It generates the income and it enables you to then follow up or to get resources who will then follow up for you. With that, we end the first part, which is follow up with both information as well as something that the customer is going to buy. Part 2: How Often Should You Follow Up? This of course takes us to the second part which is how often should you follow up? When we send out something and we expect a response, we usually get a blank and that's not because people don't want to buy, it's just that you're selling at the wrong time. What do I mean by wrong time? Well, when you want to sell something, that's not the exact time that people want to buy something, so you've got to prepare them for that moment. If you want the six secrets to following up, well, the first secret is follow up. The second one is follow up. The third one, follow up. Fourth one, follow up. The fifth one, follow up and you know the sixth one, which is to follow up again. Even if you're not sending out a newsletter, even if you're not doing anything that most people do in terms of marketing, if you're going to spend the time initiating a meeting with someone, then you want to make sure that you follow up at least six times. Take for example this podcast. Now, admittedly, we've been online for ages and you would think well, you just send out an email blast and everyone's going to go to the page and put in the reviews and subscribe and do what you expect and they don't and so I had an online Google Docs document and I put in the list of the people that I was contacting and I was contacting twenty-five people a day, every day, so guess what happens? You're looking at the number of people that you have communicated with over the past five years or ten years. I looked at my sent box and there were twenty-two thousand emails that had gone out. Now even if two hundred of them responded and did what I was expecting, that would mean two hundred into six interactions which would be twelve hundred interactions. Luckily for me, some people respond quickly. Some people don't, but you've got to have that system in place because you spent all that time creating the podcast, putting the music together, putting it up, getting all the software; there's an enormous amount of effort that goes into setting up something, creating something and then we get dejected when people don't respond the first time. You can't do that. You have to keep following up repeatedly over and over again. The point is that if you follow up with some sort of incentive, some sort of information, some sort of curiosity, it becomes less of a painful experience. When it came to my cartoon career, I was sending out those little calendars. When it came to Psychotactics, we used to send out newsletters. We gave away free products. We sold some products. When it came to the podcast, I was just following up with the people I knew, just through email; no incentive, but a certain amount of curiosity of what we were covering in the podcast, but there was a strategy for follow up and that's the message I want to get across to you today. What was the result of this follow up? After about ten days of following up, we got thirty-five reviews on iTunes. That was enough. That got us into the new and newsworthy section of iTunes, so we debuted at 55 on iTunes, which is good. I mean, you've spend all that time, you're getting a result. The next time when you're feeling nice and dejected that no one is responding to your stuff, remember, all of us have to do the groundwork. All of us have to follow up. If you don't have a follow up strategy in place, it's not going to work. But what if you were a big company like Amazon.com? Would you then do this followup? If you're on Amazon or you bought anything off Amazon, you know immediately what I'm talking about and that is that they follow up incessantly. They follow up in different ways. This morning, for instance, I wasn't interested in buying any books; however, I had bought a book in the past and they sent me an email saying which other books would you recommend to readers who've read this book? Well, that was a different question. I mean, it wasn't about leaving a testimonial. It wasn't about rating anything, it was about which other book would you like to recommend. They also put a link there about here are some other books that readers recommend and so I got curious. I went to see which books others recommended and of course, I ended up buying two books. Now, the point isn't that you don't have the power of Amazon and you don't have the data base and you don't have this and you don't have that. You have to remember that you have obstacles and the obstacle becomes the way because there is no other way but to go through the obstacle, around the obstacle or over the obstacle. Amazon, with all its resources, with all of its money, is still following up. We have a strategy at Psychotactics which involves attraction, conversion and consumption. Attraction is the followups that you have to do before someone buys a product and so you send them all of these newsletters or these reports or the podcasts or webinars or whatever content you're creating or sometimes even paid products that you just give away at that point in time. Once they buy something; let's say they go and buy The Brain Audit, we then have a post followup, which is a consumption followup which is getting the customer to consume what they bought. While this also takes a lot of time, you have to put in a whole bunch of auto-responders together; the point is that we want customers to consume the products. We don't want them to just buy it, we want them to use it. It's when you follow up and when you use technology to follow up and when you just follow up using old grind method, that's when you get clients that stay with you and that is one of the secrets of why we can take so much time off every year. That's why we can take our three month vacation. We don't have to go out there and get new clients all the time. We can just follow up with existing clients and they help us in meeting our goals. Let's summarize what we learned today. The first point we covered was how do you follow up without being a pest and you do this with education, which is good; not just your average stuff, but really good stuff. You do this with sales as well. You want to sell them a great product. You want to sell them a great service. You want to get that through because the moment they buy something from you, there is greater investment in your system, in your methodology, but how often do you follow up? Well, you follow up before they buy, six, seven, eight times; at least six times and then after they buy, you follow up as well, helping them to consume the product. It's called consumption. Finally, remember that even the giants like Apple and Amazon with all their budgets, they're constantly following up and while it's easy for us to say we don't have that kind of money or infrastructure, we do have systems and all we have to do is work out a strategy to follow up. It's not going to happen today or tomorrow, but over time, that strategy gets to be better. If you've received a chocolate from us or if you've received a postcard or you've received an email, you'll know exactly what I'm talking about. What's the one thing that you can do today? When I went to Compaq, I just didn't have any strategy. When I launched this podcast, despite being as busy as you know I am, I had to follow up, over and over again, but I had a strategy and I had an Excel spreadsheet. For those of you who know how much I love Excel, well, I had an Excel spreadsheet, so that's how keen I was on followup and that's how keen you should be on followup. Any followup strategy is going to be better than no followup strategy. It gives you a much clearer idea of what you're going to do in the weeks, months and years to follow, but even so, for the next few months, have some sort of strategy, any strategy will do. It's still better. That brings us to the end of this episode. If you haven't already subscribed, you know what to do. Go to iTunes, subscribe, give us a rating, help us along. We need the help. This is the tenth episode and we're into double figures and that's me, Sean D'Souza saying bye for now. This has been brought to you by The Three Month Vacation and psychotactics.com. Once you subscribe, make sure you go to Psychotactics and subscribe to the newsletter as well. Bye bye. Great podcast, but the numbering on your website sometimes differs from the actual file name, plus iTunes only starts with episode 17 I believe. For instance this podcast is displayed as number 10 in the series, but if you download it, the file name I think states it’s number 16 in the series.